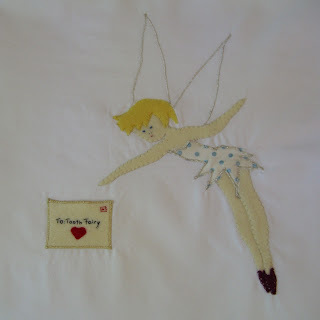 I made a Tooth Fairy Pillowcase (as dreamed about in my Pillowcase Tutorial.) I really love it - it is crisp, white and simple. It was really difficult to get a photograph to show just how sweet it is. 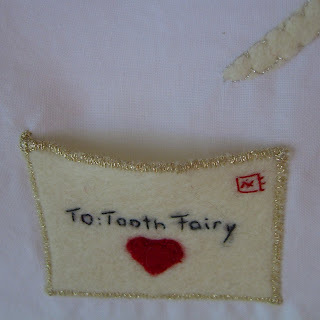 There is a little pocket - disguised as a letter to the Tooth Fairy - so you have somewhere to put the baby tooth and somewhere she can leave her gift. As a child I got 20p piece for each tooth - what did you get?? 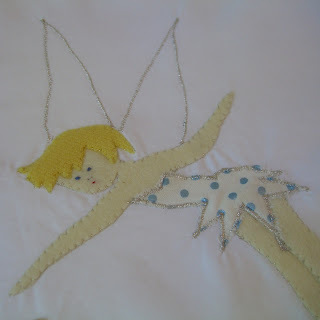 ... but I based her on the most famous of all the fairies - Tinkerbell - I hope this wasn't cheating too much. I've also been tagged by Julie of Little Cotton Rabbits and Dyan of Flower Childe Cottage so here I go ... I hope I'm not too dull! Ten years ago I was working in London as a secretary for a bank. My husband was actually my boss - and it all sounds a bit of a naughty office romance - and no one believes us that nothing happened until I had actually left that job. I still giggle at how it all worked out. We have now been together since 2001 and now married for 3+ years. 1. Weed the vegetable patch. 2. Practice the piano more - I'm a lazy student. 3. Try and focus on rabbit crafts rather than getting distracted by my new love of pillowcases. 5. Spend more time with my husband - which is impossible because he is always at work! Cheese - any sort - but if it is with fig jam - all the better. Kashi Go Lean Honey & Almond Crunchy cereal with yogurt - yum. Is Diet Coke a food group? I do hope so! Buy a Fiat 500 ... preferably with a sunroof and bright yellow. The tooth fairy pillowcase is so sweet. I love her polkadotted dress. How funny that you worked for your husband and then later married him! What a sweet pillowcase, it is just lovely. I was also tagged by Julie and I still have to get to it, hopefully I will this weekend. Your toothfairy pillowcase is so sweet! My children always get a $2 coin (which is a small gold coin). When i was a child, we got 10c plus a bright red apple. Great meme facts! Only one pair of expensive shoes? I just love the pillow case! What a great idea! We could have used one this week as my big girl lossed a tooth on Wednesday. My first car was a Fiat aren't they lovely! And I love it that you want a donkey! Lovely tooth pillow case. My daughter has just lost her front two teeth and the tooth faries left her £2 for each one. I love your tooth fairy pillowcase. When I was little I used to get a silver sixpence hidden under the corner of the living room carpet! That's a gorgeous tooth fairy pillow. My two write notes to their tooth fairies - I have woken at 4am in a cold sweat before now because I've realised Arrrrrgggghhhh - the note! wow what a great idea.. !!! 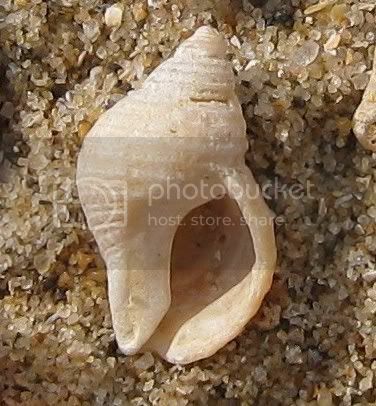 this tops my tooth fairy pillows.. wonderful! Rachael, that is a truly gorgeous idea.............HMMMMMMMM I wonder if you could do a denture pillow for Nana to put her false teeth in...... or is that just wrong? I love it. I loved reading your 'tagged' responses.